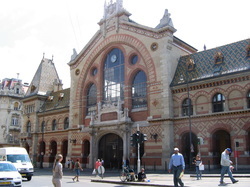 The covered market in Budapest. People worry all the time about not speaking the language to interact with locals when they travel. Don't. Of course, I have the same problem. I studied French in high school, college and during one summer at the Universite de Dijon. So, that one is OK. It isn't fluent, but after I spend a week or so in France, it all comes back. I can even go to the theater there and get enough of it to be worthwhile but no modern slang, please! I also studied Russian in high school but have succeeded in forgetting most of it. I have only been to Russia once for 2 weeks (on a package tour). Last summer when I went to Latvia overnight on a boat from Sweden, I did find out my Russian still worked enough to get around the market in Riga and understand that when the old ladies were trying to sell me schmatas (crummy clothing) and said "ni doroga", they meant "not expensive". Of course, I am not likely to use Russian too often unless I break the bank at Monte Carlo and decide to take the Transiberian Express--one of my "dream trips" that is not very likely to happen due to cost. What to do about the rest of the languages? I regard foreign language study in advance of any trip as an integral part of the trip. if you are going to an area where English is not widely spoken--such as Scandinavia--you had better prepare. While many people are advocates of Rosetta Stone, I'm not. I have Spanish I at which I have made indifferent stabs. The problem is that you have to sit down at the computer and pound away at it. I am not good at that sort of thing because, well, if I sit down at the computer, I can easily get diverted by things like facebook, twitter and weebly. It just doesn't work for me. I am a walking ad for Paul Pimseleur's program. Please note: I have no financial relationship with Pimsleur other than being a satisfied customer. I have 4 levels of Spanish, 2 levels of Italian, 3 levels of Russian, 1 level of Turkish and a short course of Swedish in the house. I have done them all at different times. I also have Mandarin but I never seem to get around to it because trips intervene and I have never planned a trip to China (virtually impossible to get a home exchange there; I'd have to take a tour). Except for the Mandarin, I've done them all--and sometimes more than once. The lessons come in different formats and you will need to check online for the cheapest deal on whatever format you want--and for prices. I am not going to recommend a particular website. If you google "Pimsleur", you will find all you need to know. The system does work and, best of all, I do it in my car. Whenever I am doing a language course (and I am currently reviewing Spanish in preparation for my sojourns in Spain and Costa Rica this year), I simply have the course in the car and play each CD over and over (generally 3-4 times the first time through) until it "locks in"). Then you move on to the next lesson. Pimsleur study for all my trips where English is not going to be my principal language. The official Pimsleur site can be found here, but search the web and you might find other sites that sell the language you want for less if you check around the internet. Now I end with a funny story. In 2007 I home exchanged in Vienna. No, I don't have German, but I probably should. Due to hearing a lot of Yiddish growing up (remember I'm an "alte cocker"), I understand quite a bit. I can't speak it at all so I probably should get Pimseleur German, but I digress. During my home exchange in Vienna, a 3 day sojourn was planned in Budapest. Hungarian is one of those languages tagged as "difficult". My reaction to that kind of a statement is that plenty of 3 year olds speak it perfectly. It can't be that difficult. Pimsleur did not have Hungarian at the time, so I got a CD from someone else--just basic stuff. The story that I will tell you took place in Budapest but not in that market. I travel with clothes that I do not worry about losing and a cheap watch. My watch for in Budapest kept falling off. I finally lost it and had to find a replacement. Into some cheap souvenir place I went because they had watches in the window. I told a young in English what I was looking for (souvenir places always have a young person who speaks some English wherever you are). He pulled out a cheap watch. Then the young man began to have a discussion with his mother. I understood it! They were charging me something like $20 instead of $15--the foreigner price. I had learned the numbers in Hungarian. I was so stunned that I understood them, that I did nothing. I simply did not want an argument about $5. A little bit of language study can go a long way. If I ever get a home exchange in Hungary, I'll be buying Pimsleur Hungarian and telling off cheaters the next time. For now, I just ordered Polish Comprehensive because I have an exchange in Poland for July 2014.